Phase IV is getting to some rarified space. While there are groups or divisions within companies who are demonstrating phase IV behavior and results, there are few complete companies at this level. To get a sense of how many, I turned to CSRHub. This powerful on-line resource distills some 291 sources of data into a 100-point scoring system. Using CSRHub score as an indicator of where a company is on the change matrix can give an idea of the distribution of companies on the journey. Out of hundreds of thousands of companies worldwide, about 8,500 have been identified and analyzed for their sustainable business efforts. Fewer than 2000 score above a 56 and no company scores above an 80. 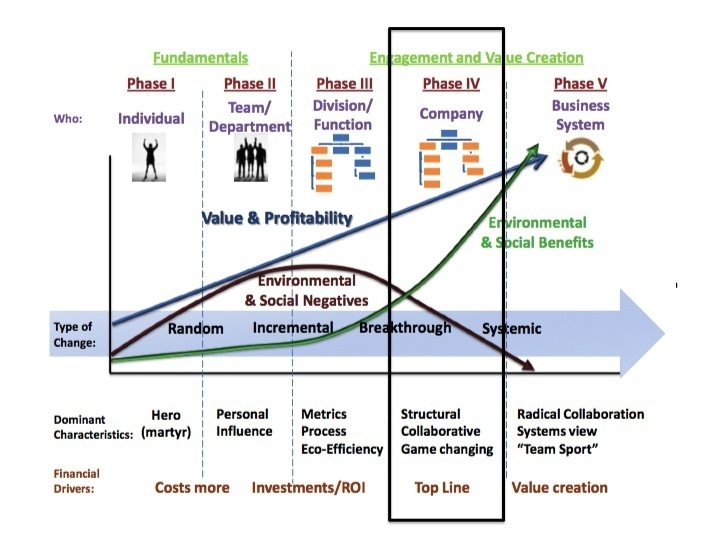 That suggests that less than 1% of companies are possibly operating at phase IV and none have achieved phase V yet. With so little real world experience it becomes clearer why there is little understanding of this definition of “sustainability”. It also says that companies just getting started are not too late.